Das elfte CD-Album in unserer Alhambra-Reihe mit Werken des berühmten italienischen Komponisten Angelo Francesco Lavagnino (1909 – 1987) widmet sich dessen Zusammenarbeit mit dem legendären amerikanischen Regisseur Orson Welles und präsentiert vor allem die Weltpremiere der kompletten Originalmusik in Stereo zu dem unvollendeten und lange verschollen geglaubten TV-Film THE MERCHANT OF VENICE von 1969. Neben der Originalaufnahme bringt die CD zudem die 22-minütige Neueinspielung mit dem Orchestra Classica di Alessandria unter der Leitung von Roberto Granata zu Gehör, die zur Eröffnung der Filmfestspiele in Venedig im September 2015 live gespielt und aufgenommen wurde. Lavagnino schrieb für diesen Film in nur wenigen Tagen eine temperamentvolle und festliche Musik mit Renaissance-Zeitkolorit neben einem melancholischen Liebesthema für Shylocks Tochter Jessica. Auch die beiden früheren Lavagnino-Scores auf dieser CD entstanden für Welles´ Shakespeare-Adaptionen. Aus der Originalmusik zu OTHELLO von 1951 erklingen drei Tracks, die durch ihre ungewöhnliche Vermischung mittelalterlicher und modernistischer Klänge faszinieren. FALSTAFF aus dem Jahre 1965 ist mit rund 20 Minuten repräsentiert, darunter befinden sich auch einige Tracks, die nie zuvor veröffentlicht worden sind. Für diesen Film schrieb der Komponist einen kraftvollen exotischen Marsch und für die berühmte Schlachtszene ein kontrapunktisch eingesetztes musikalisches Requiem für Sopranstimmen. Das Originalband von THE MERCHANT OF VENICE stammt aus dem Nachlass des Komponisten und wurde uns freundlicherweise von dessen Töchtern zur Verfügung gestellt. Für die Verwendung der Neueinspielung dieses Scores möchten wir uns beim Dirigenten Roberto Granata und dem Leiter des Lavagnino-Festivals in Gavi bedanken. 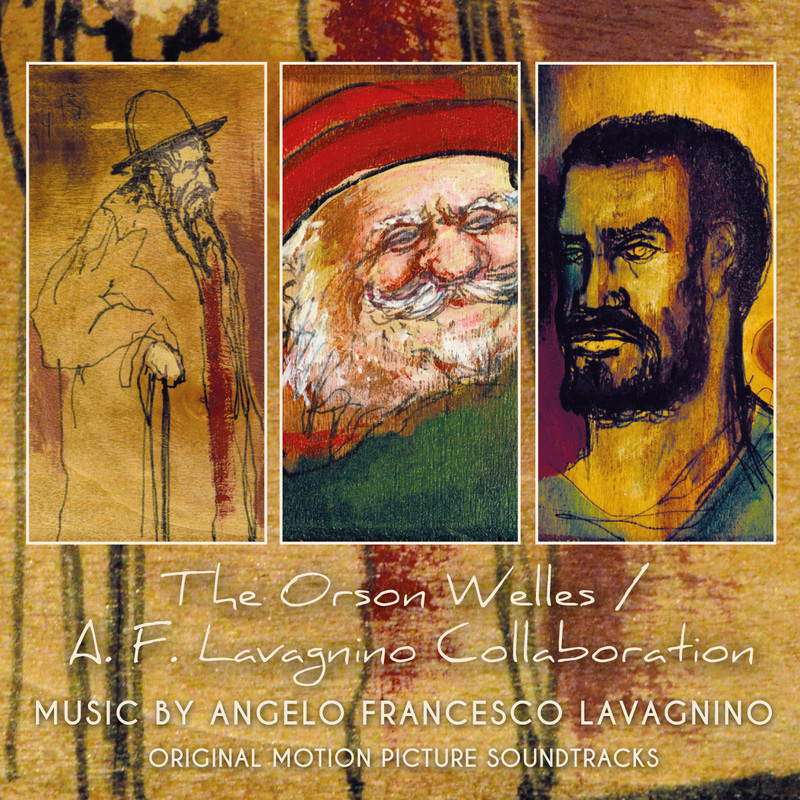 The eleventh CD in Alhambra Records` series with scores composed by Angelo Francesco Lavagnino is devoted to his collaboration with the legendary American director Orson Welles and above all presents the world premiere release of the score for the medium-length unreleased and unfinished 1969 TV movie THE MERCHANT OF VENICE – both as complete original recording in stereo and as a re-recorded suite which was performed live at the Venice Film Festival in September 2015 by the Orchestra Classica di Alessandria conducted by Roberto Granata – as well as partly unreleased excerpts from the original recording of FALSTAFF from 1965 and three tracks from OTHELLO from 1951. The common denominator of these three works is that all of them were Shakespeare adaptations. Each of these assignments was an exciting challenge for Lavagnino as besides incorporating authentic musical sounds and colours of the historical periods it gave him the chance to experiment and to find unconventional and often quite unique musical solutions with great artistic creativity. 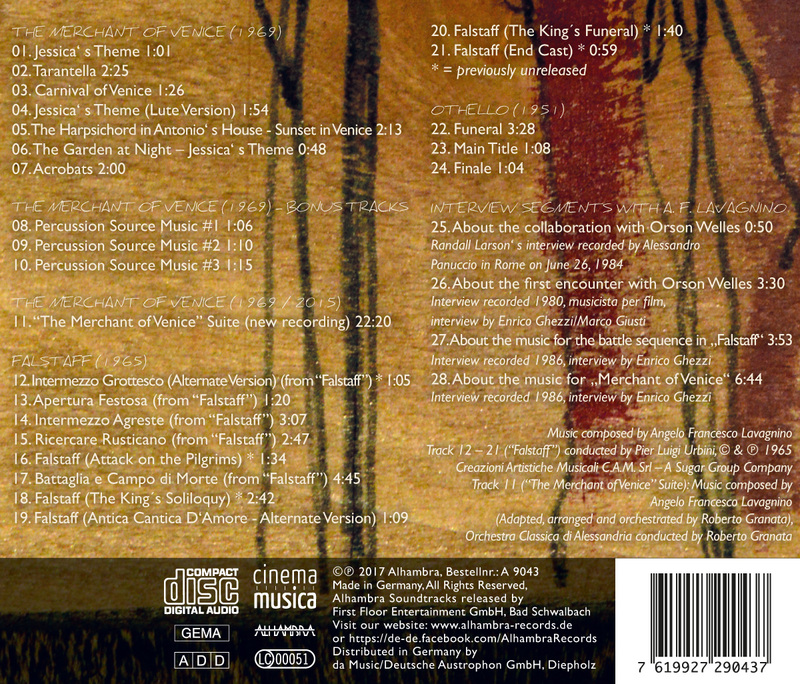 By listening to the various Lavagnino interview parts (English translations of them can be found in the booklet) which we have attached as bonus tracks at the end of the CD it becomes evident that the relationship between composer and director was characterised by great confidence and mutual respect. For OTHELLO Lavagnino and Welles worked closely together for many months to find an adequate and unconventional musical approach which would match the bold framings and the brilliant expressionist visual style of the film. Even today Lavagnino´s wild mixture of medieval and modernistic sounds for a small ensemble of 16 musicians and 20 choristers is compelling and we have chosen three tracks from the original recording for this CD. The score for FALSTAFF in 1965, which was partly based on medieval songs and dances, had to be written in only eight days. The main theme which is heard in the Main Title Apertura festosa is a vigorous martial march whereas for the famous Battle of Shrewsbury sequence Lavagnino used music in a contrapuntal way and wrote a kind of musical requiem intoned by a choir of female sopranos. Particularly notable among the previously unreleased tracks are the rhythmically exciting music for the Attack on the Pilgrims, the noble theme dominated by oboe and viola for the tormented and weary King Henry IV´s Soliloquy and the sombre march for The King´s Funeral. Welles´ last Shakespeare adaptation THE MERCHANT OF VENICE from 1969 had originally been conceived as a 40-minute episode of the CBS TV special “Orson´s Bag”. Long considered lost and unfinished as the last of four reels had not been shot by Welles in 1969, a restored version with 36 minutes was shown at the Venice Film Festival in September 2015. Lavagnino wrote and recorded the short original score which is only about 15 minutes long in just 2-3 days. He didn´t even want any fee from Welles, but in the end received 12 paintings of various Shakespeare characters which Welles had drawn on the back of his cigar boxes – a few of them can now be seen on the cover and within the booklet of our CD. Lavagnino wrote a sprightly tarantella and festive brass music to capture the mood of the setting as well as lovely theme for Shylock´s daughter Jessica which is heard in various instrumentations. For the suite re-recording on our CD, composer and conductor Roberto Granata has arranged and partly expanded the original score in an excellent manner to give it a new life. This exciting CD project has only been possible thanks to the generous support of the three daughters of the composer – Bianca, Iudica and Alessandra Lavagnino –, who provided us with original master tape of THE MERCHANT OF VENICE. Our thanks also go to Luciano Girardengo – the director of the Lavagnino Festival in Gavi – and composer-conductor Roberto Granata who allowed us to use the newly recorded suite of THE MERCHANT OF VENICE for this CD. Our CD edition which contains a 20-page booklet with extensive liner notes and numerous stills from the movies will be limited to 300 copies. Track 12 – 21 (“Falstaff”) conducted by Pier Luigi Urbini, © C.A.M. s.r.l.